Last December I read Monica Ferris’ Crewel Yule as part of a holiday reading challenge. Oddly enough, I really enjoyed it and knew I’d be back for more. 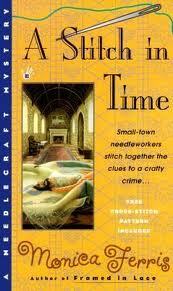 This is my fourth in the Needlework series in which there are 15 books total – last published 12/11. After Cruel Yule I’m reading them in order. These are cozy mysteries but they’re sharp and funny and pretty fair mysteries. They have all the twists and turns of any good old fashioned “who-done-it” and the well drawn and consistent, likable characters necessary for a great series. In the first book of the series, Betsy Devonshire goes to stay for awhile with her widowed sister in Minnesota while she gets over her divorce. Someone kills the sister leaving Betsy as shop-owner. Betsy solves the crime and takes over the shop – at least temporarily. In the second book a body is found when an old barge is dredged up out of the local lake. Betsy solves the crime and decides to stay in Excelsior. I can’t help but wonder what’s coming up.